Every time my family sits down to dinner these days I smile. I look around and feel blessed. The simple, everyday act of enjoying a meal together. "They" say it's important family time, the coming together at the end of the day to reconnect. But it's not that I feel all that disconnected from my husband and kids during the day. How can I when I'm a stay-at-home mom, my son is in only half-day kindergarten and my husband's health problems are preventing him from working right now? My daughter, in 6th grade, is the one who's away from the house the most. But after school and on weekends, she's mostly home too. So in all actuality, I have plenty reason to be darn right SICK of these people! But not when we sit down to dinner. Right now, I am just so happy that ALL FOUR OF US are sitting there, at our new-to-us bigger table. Me, Camryn, AJ....and Mark. I sit down, look at the faces of the the people I love and am filled with pride, and not just a little bit of awe. Pride in my children and awe in Mark. Pride in the special little family we are. Because Mark is sick and has almost died. Because he fights. Because he is probably the one who prepared the meal. And because it's most likely a damn good meal. Because our family is unique. So sitting down to dinner as a family has a little extra meaning in our house. I see it, feel it, know it. Such a simple thing, the act of sitting down and sharing a meal, but it is a great time to really just look at our little families and be grateful! Yes, sometimes it's hard to et AJ to sit still too. I love dinner with my family. We have yet to sit down together at our new table, but I'm really looking forward to it. Guess I just need to make things slow down and get dinner on the stove in a timely manner! This is so lovely, Jennifer. Sharing a meal together is a very important thing and I can tell your family really enjoys that time together. I did have a nice birthday, thank you! Lovely, Jennifer. When I was a kid we sat down to dinner every evening - and we all hated it - because of my father and his quizzes and his lectures. So to have your kids enjoy the experience is worth its weight in gold, not to mention having your husband there and him as the chef! I don't have any kids, but its the one thing my significant other look forward to the most, when we sit down with each other at the end of our day and enjoy a dinner we cooked ourselves. Very cool post. My kids do seem to enjoy it. I think they like the attention they get when we ask about their day. I love this. You are right, it is so important to carve out that special family time. Happy Birthday to you! Happy Birthday to you!! Happy Birthday dear Jennifeeeeer!!! Happy Birthday to youuuuu!!!! I hope it was as wonderful as you are!! My family always sat together for meals, too, especially dinner. It was one of the best parts of the day, sharing our day and laughing a lot! It's lovely to see another family doing this and appreciating it, too. 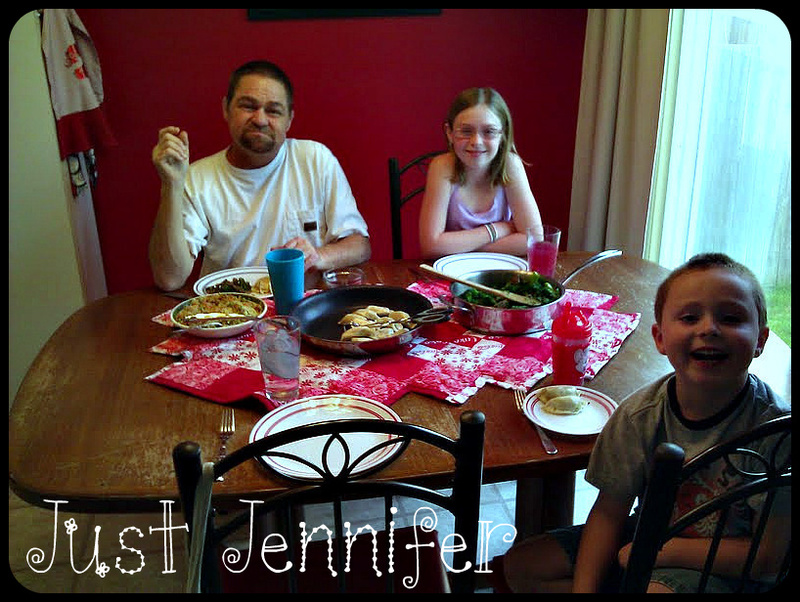 :) Wishing you and your beautiful family many blessings, Jennifer! We had some issues last night. It's not always perfect. Dinner time is precious and important and fundamental. My dad always insisted we sit down together at the dinner table and I didn't appreciate why until I was older. Wishing you many more awesome dinners together! It's so hard for us to get certain things until we get older, isn't it? This is the one thing my husband always insists on, eating dinner together at the kitchen table every evening. I didn't grow up with a family that did this and I love that it has become my tradition now with my own little family. I love the picture you included and your post is a great reminder to look around and who we are sitting with and be truly thankful. It was also my husband who insisted on dinner at the table. That, and our kids can't be trusted to eat anywhere else! Thank you for sharing how, and why, you so treasure these moments together, having a meal as a family... Many of us take it for granted. And so much more. Time to pause and be thankful. Sorry to hear about your hubby, it is my first time here, so I will read more, but looking at your blog cloud, it's very telling. Yeah, I'm pretty transparent like that. In Chinese culture, dinner is the most important family affair. Normally we will wait for everyone to be home before dinner is served, even if it's at 9pm. I believe it's the same for other cultures, dinner is the time to bond and unwind after a long day at work/school/etc. By the way, you have a beautiful family, Jennifer. It's sad how often we stress about dinner. Thank you! I guess for me that feeling is called 'safety'. Don't know why, but being all at the table makes me feel at ease knowing all of us are safe - at least at that moment. Aren't those moments amazing? Growing up my family always sat down to dinner together. Now those are some of my best memories. So good to know I'm making good memories for my kids. I changed jobs and am living with my parents for a month or so while I find a new apartment. I must say that it brings back a lot of memories eating dinner with them some nights while I am home. There is definitely something special about it, and something that I haven't realized that I missed the past few years. yay for you LIVING in THIS moment! That is hard to do no matter the circumstances. So happy for your family! It's what I'm trying to do every day. And this is a simply, beautiful comment! Wonderful post and a priceless photo! That's so great that you can all share that time together every evening! those smiles say it all. amazing how the most basic of acts can have such a profound meaning in our daily lives! I'm a firm believer in the "little things". AMEN to that! I love mealtimes together. Unfortunately I have to work 3 nights out of the week and pretty much my start time is at dinner time, so the days I'm not working we try to take advantage of it and all eat together at the table. I don't like not doing it every night, but I also love being with my boys during the day and working nights allows me to do that. Great pic of your family! Mark had evening dialysis for awhile and it sucked for dinnertime, so I know what you mean. We have make trade-offs sometimes. THere is so much to be said for all sitting down as a family and eating. That is one area where I have somewhat failed. We are all pulled in different directions that it doesn't happen much. The one exception is Sunday lunch after church. We always sit down as a family. Keep up the good work. I think whatever is special for your family you should do. Sunday lunch after church is awesome! I don't focus on it as much now since the toddlers need about twice as long to eat as we do. However, when they are older I intend to become VERY stringent about our all eating together. And no DEVICES at the table. Nonono. You are so right, Jenn. 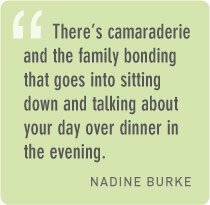 It's those meals where we truly do come together, without the constraints of everything else to share in a meal and share our days. I'm so happy to see the family around the table!